The last day to register to vote in the November 6, 2018 State Election is Wednesday, October 17, 2018. You can register to vote online at the Secretary of State's website by clicking here or you can register to vote in the Academy Building at the Town Clerk's office. Pre-registration is also available both online and in the Town Clerk's office. 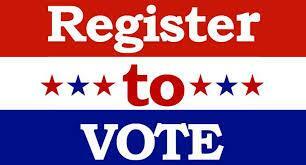 Though you must be 18 years old in order to vote, you may pre-register to vote once you are 16 years old. If you are 16 or 17 years old, you may submit a voter registration form to your local election official, who will then place your name on the list of pre-registrants. You will receive a pre-registration notice by mail, confirming receipt of your application. Once you become old enough to vote, your local election will mail you an acknowledgement notice, which is confirmation that your name has been moved from the list of pre-registrants to the list of registered voters. Your acknowledgement notice will include your party affiliation and the location of your polling place. It is important to keep your local election official informed of any changes to your information. You must submit a new voter registration form if you wish to change your name, address, mailing address, or political affiliation. Please click here to register or pre-register to vote.